It’s always difficult to imagine, but there was a time when – despite its runaway popularity and box office appeal – there was only a handful of X-Men books on the racks (and its rosters – where there were any – were pretty much consistent, but that’s an issue for another day). When it did come time to spin a few X-Men off into their own books, they were pretty judicious – there was obviously a Wolverine miniseries to be had, an expansion to the franchise by way of the New Mutants, and the fairly-relevant Magik limited series which tied into a storyline from the main book. Additionally, they spun off solo adventures of some of their most popular characters, like Kitty Pryde riding shotgun on a second Wolverine miniseries, Nightcrawler getting his own interdimensional adventure and of course the most popular X-Man of them all – ICEMAN. Looking at his history, it’s fairly obvious that the powers-that-be at Marvel considered Iceman a character with potential as a top-tier star, despite all indications to the contrary; he nailed some solo adventures, got to hop off to the Champions and the Defenders (with pals in tow – if any doubts existed as to Iceman’s possible popularity, he was paired with the Angel to get him over the hump), was one of Spider-Man’s amazing friends, and remember when they were teasing an Iceman/Wolverine rivalry in X-Men? They did, they really did, Iceman was going to throw down with Wolverine all the time. I would’ve loved to have seen it. 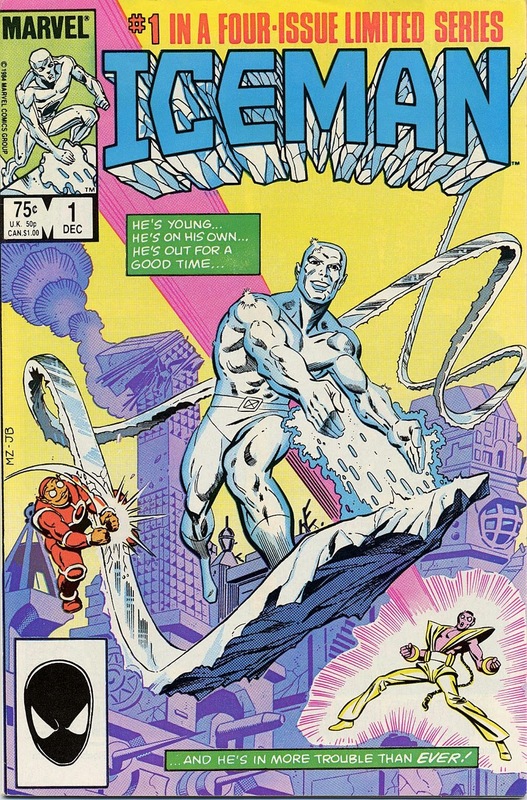 When Iceman finally got to have his name on the title of a book, it was a four-issue miniseries written by J.M.DeMatteis and which was all but fully removed from any contemporary storyline in the X-Titles or in The Defenders, the book which was Iceman’s then-monthly home. In fact, in large part because it was DeMatteis at the helm, the story is almost completely in the author’s wheelhouse – DeMatteis is a literate writer who exhibits surprising depth considering his medium, but it’s fair to say that he has persistent themes. Also sometimes his prose sounds like Prog Rock lyrics read aloud. To wit, the four issue series finds Iceman, aka Bobby Drake, returning home to his small, idyllic suburban home for a family reunion, and promptly collides with the combined menace of (DeMatteis Theme A) an overpowering cosmic force which represents an existential concept surrounding individual identity and perception of the self and (DeMatteis Theme B) mommy and daddy issues. Frankly, the book is only shy from being the penultimate DeMatteis project by the absence of a comical creature with a yen for Yiddish, although it does have a pair of cosmic henchmen known as White Light and The Idiot, drivetime radio hosts of the dimension at the end of time. They’re sent off under orders of OBLIVION, an ominous cosmic entity who’s blasting his biceps, takes colloidal silver treatments, and wears a pizza joint tablecloth as a hat. "May I offer you a bucket full of Creatine? As it happens, Bobby Drake is suffering an identity crisis (DeMatteis Theme C) owing to his parents’ expectations and his own uncertainty as the best path for his life. Throw into the mix a beguiling girl-next-door to dazzle Bobby and throw his self-reflection out of whack, and it takes spacetime assassins and time travel to sort it all out. That’s sort of DeMatteis Theme C.5, that last bit. Enjoying a then-unprecedented amount of liberty with the character – who’d bothered to flesh out Iceman before now? - JM’s able to give Iceman a coddling mother and disapproving father, as well as a combination Jewish AND Roman-Catholic background for MAXIMUM GUILT. Even having saved his relatives and hometown from an invading horde of cosmic Oblivion-sent monsters leaves the ex-X-Man wracked with self-doubt. Good thing this is exactly the kind of thing Oblivion likes to wander around the nether-dimension of nothing which he calls home showing people the futility of (pardon the dangling participle). 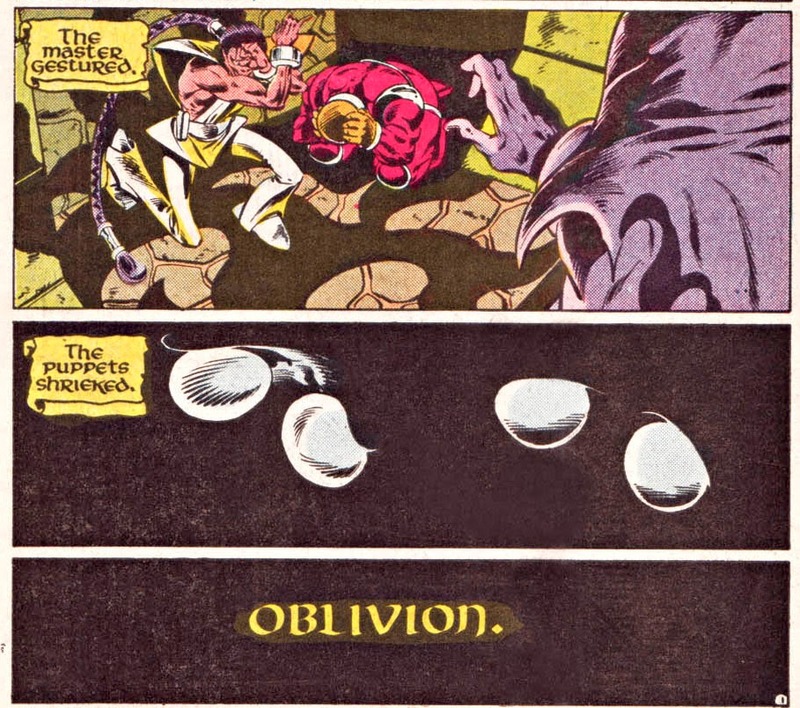 Oblivion’s seeking his wayward daughter, who also happens to be a time-travelling tin tyrant with a kidnapped family in tow AND the girl next door with whom Bobby fell immediately in love. 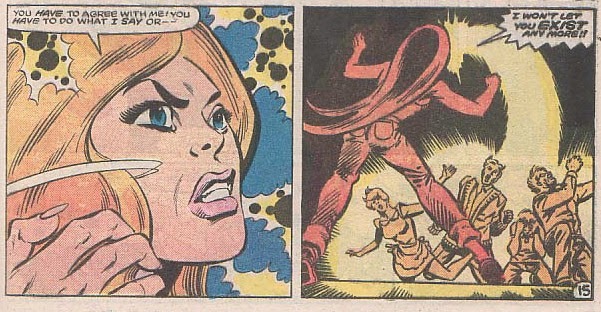 Inadvertently chasing her through the timestream ends up sending Iceman back to the heady days of World War II, coincidentally being rescued from an over-eager cop’s hastily delivered warning shot (a little low and to the inside) by his own parents, years before their marriage and his birth. He tells all this to a guy he's known for literally fifteen seconds. 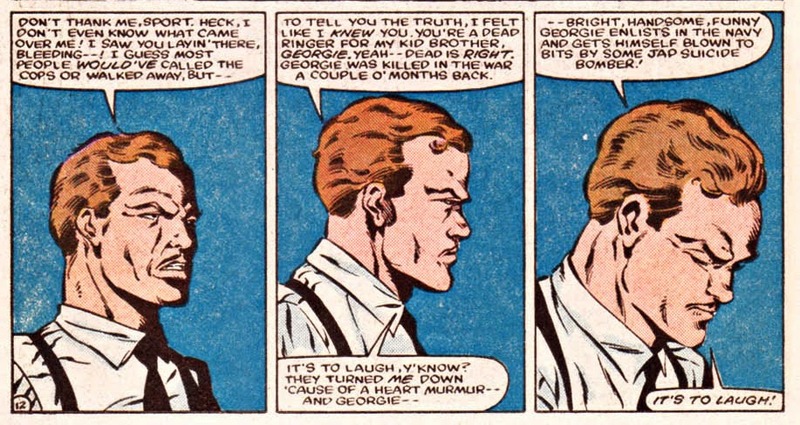 Accidentally getting his father killed – and thereby wiping himself from the face of the Earth – is what launches Dematteis Theme D, the stream-of-consciousness miasma of the self in which identity is sought but only mocking semblances of friends and family arise to undermine the hero’s confidence. Can you believe that’s one of this fella’s go-to things? In the end, it’s a combination of having confronted his own oblivion and losing the girl he’s imprinted upon for reasons of narrative convenience which get Bobby Drake to a good place in his relationship with his parents. Meanwhile, in Wolverine’s solo book, he fought ninjas and Nightcrawler fought alien pirates. But no, this is good, therapy, that’s just as much fun as ninjas and pirates. I bought all four issues of this, and I can't remember a damn thing about it. 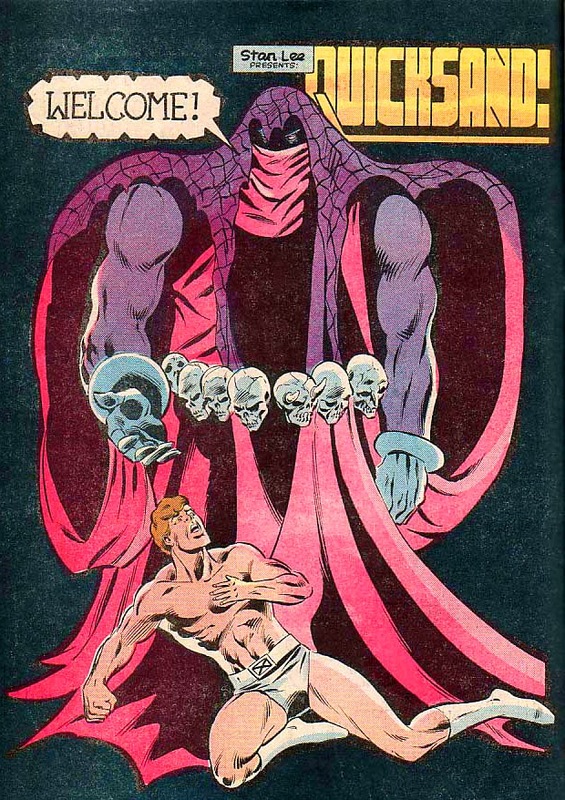 Wait, no, I remember the cover of #4 with the vortex of monster skulls. Could be that, unlike the Miller/Claremont Wolverine series, I never had the urge to re-read this. Gotta give J. M. DeMatteis a bit of a shout-out though: Greenberg the Vampire had an intriguing amount of sexing (granted, mostly implied) for something I was allowed to buy as a teenage boy.